CB Athletic Training and Conditioning For Alpine Skiing! Alpine Skiing is an awe-inspiring sport, however it commonly accounts for many recreational winter injuries, especially if you are not physically prepared. So if you plan to hit the slopes this winter, you should consider some of the training tips found in this issue. In addition to the use of physical training for injury prevention, more and more competitive skiers are investing their summer time (the off-season) in the weight room (and in other training areas) to improve their performance. Fortunately, there are many excellent strength and conditioning coaches such as Matt Jordan (Calgary) and Sarah Applegarth (personal best in Mississauga) to help you invest wisely in your summer training time for optimal winter performance. You will get to learn more from them later, but first the Craig Ballentyne philosophy on alpine ski training will be explored. When designing a program for any sport, you must ask yourself, "What type of strength do I need?" and "What specific mode of training will help me?" After this, you can plan the program. 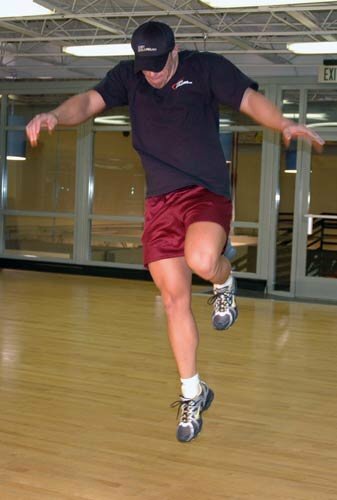 Remember that the emphasis of the program should be to train movements and physical abilities and not just individual muscles. Alpine skiing should benefit most from increases in lower body strength, power, balance and agility, as well as core (abdominal and low-back) strength. Basic exercises like squats and some single-leg exercises are likely your best bets. In addition, core strength is being pushed as an essential component of sport performance. These physical attributes appear important in skiing because you must be able to maintain an upright trunk and hip position throughout the race and this would be difficult without core strength. You can see there are a lot of performance aspects an alpine skier should address. Below are the CB Athletic Consulting tips for efficient sport-specific Alpine Ski training. Instead of spending 5-10 minutes on a stationary bike performing a non-specific warm-up for resistance training, use those 5-10 minutes to perform several sets of bodyweight full squats, bodyweight step-ups, single-leg squats, and single-leg deadlifts. Take advantage of the ability to gradually increase the intensity (i.e., move from full squats to single-leg squats) to better spend your warm-up time rather than wasting it away on the bike. 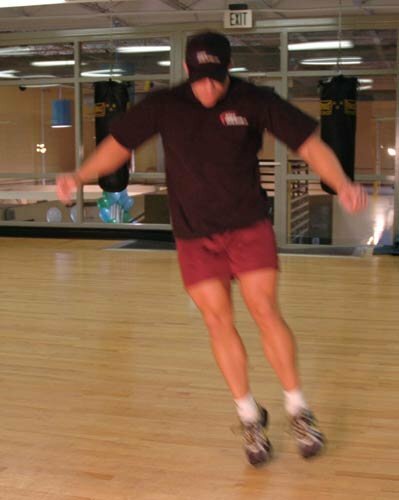 Plyometrics will strengthen your balance and help you become more explosive for competition. 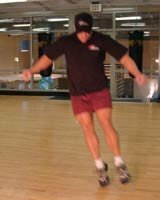 Below is a sample plyometric, balance and agility training program. All of these performance aspects have been integrated into one session. In theory, this should provide the optimal training stimulus to improve a skier's explosiveness and body control. 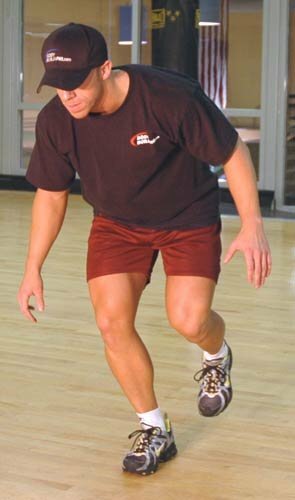 In the "land and hold" drills below, the athlete should perform a maximal effort jump or hop and attempt to land and hold the position while maintaining total body stability. In the "skier's plyo", the athlete will perform a maximal lateral jump to one side, but upon landing will rapidly change direction without a pause. Repeat for the given number of repetitions with an emphasis on exploding off the ground with little pause (contact) time. 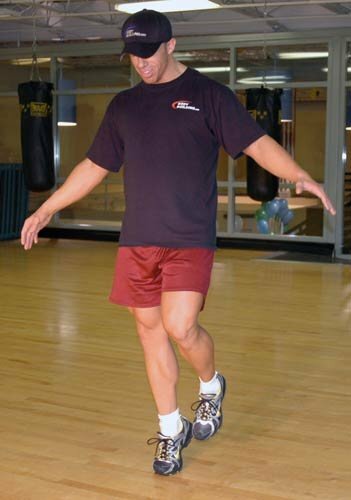 Finally, in the balance drill, the athlete will attempt to stand on the ball of one foot for 30 seconds. Repeat for the opposite leg. To increase difficulty, the athlete can perform with eyes closed. 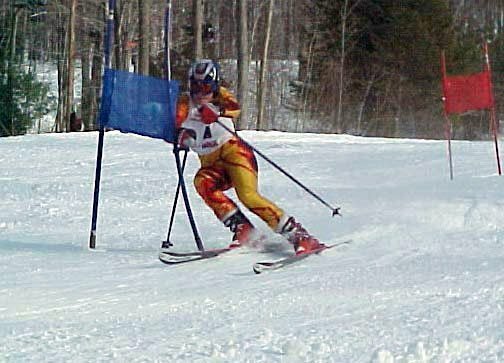 This drill comes from the Ontario Junior Ski program. 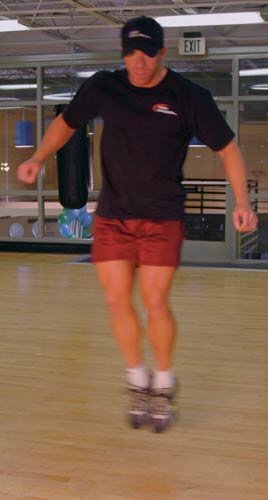 Single-Leg Hop "Land And Hold". Standing Long Jump "Land And Hold". Lateral Jump "Land And Hold". 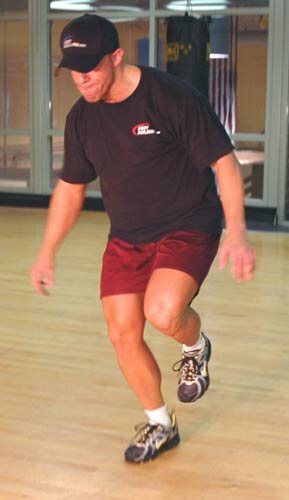 Single-Leg Balance Drill "With Eyes Closed". Click Here For A Printable Log Of This Skier's Warm-Up. For competitive skiers, you must train for the demands of your event, whether it is isometric strength (where your muscles contract but don't lengthen) for turns or rotational power for jumps. Regardless of your event, you will always need a great deal of eccentric (negative) strength to absorb force upon landing. 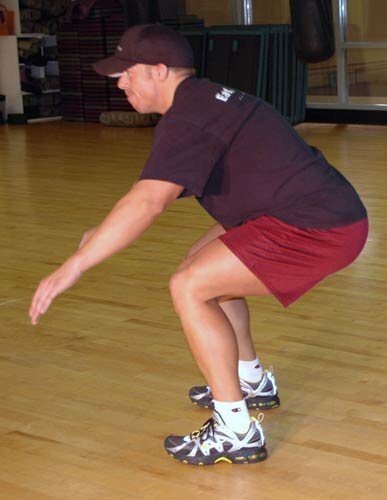 Skiers should emphasize the lowering phase of the squat, lunge, and step-up exercises. In addition, like all sports where success depends on relative strength (amount of strength per body weight), a skier should have a low body fat percentage. Your relative strength will be improved by adding muscle mass and decreasing body fat. Therefore, you will have more strength relative to your body mass. Less body fat will mean less mass you will be forced to control during a ski run. This program is dead on for what skiers require, because it addresses all the muscles and emphasizes single-limb training. Even though you ski on both legs, there are few times (if any) that each leg contributes equal force during a run. Increase your work capacity and muscular endurance in the squat position by holding the parallel squat ("Ski crouch") for increased lengths of time. 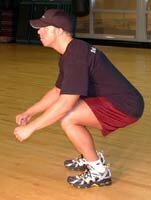 Starting with bodyweight only, descend into a "Ski Crouch" (parallel squat) and hold this position. Determine a specific length of time you want to hold the position for (i.e. 30 seconds) and perform several reps with short (10 seconds) rest intervals between each rep. Perform sets of 5-6 crouches. You may need to begin with a shorter work interval and progress. You can also increase the intensity of the exercise by performing the exercise with a loaded bar. This recommendation is based on data from fitness testing of the 1981 Canadian Olympic Ski team, performed by Dr. Duncan MacDougall and Dr. Digby Sale. The results of testing showed that there was little correlation between downhill times and aerobic fitness. However, the better skiers more often had greater leg power. Thus, the focus of your training should be leg power, not aerobic fitness! Dr. MacDougall recommended that scores of 50 and 55 ml/kg/min are sufficient for women and men, respectively. Therefore, use sport-specific interval training to prepare for performance. Here is some key information from a relevant, yet technical, article from the June issue of the American Journal of Physiology (Bangsbo et al., 280: E956-E964, 2001). The researchers examined the effect of repeated bouts of prolonged intense exercise on exercise efficiency and the contribution of different energy systems. 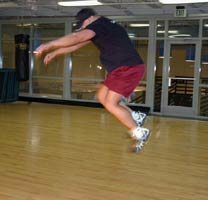 Subjects performed 3 minutes of exercise, rested 6 minutes, and then performed a second 3-minute exercise bout. In the first exercise bout, anaerobic energy pathways contributed 83 percent of energy production in the first 5 seconds while the contribution of aerobic energy production was 17 percent. Anaerobic means "without oxygen." Aerobic, on the other hand, means "involving or improving oxygen consumption by the body." Aerobic exercise, therefore, enhances respiratory and circulatory efficiency by improving oxygen consumption. Total energy production per unit time was increased due to exercise inefficiency at the end of the 3-minute interval. That is, subjects had to work harder to maintain the same force output at the end of the 3-minute bout. Also, the anaerobic energy production was only 23 percent at the end of the interval. The researchers also found that anaerobic energy contribution was lower and aerobic energy production was higher during the second exercise bout. This means that exercise efficiency decreases with the duration and frequency of intense intervals. So, How Does This Apply To The Skier? Many people don't realize that the aerobic system contributes to the early part of anaerobic intervals. But it does! 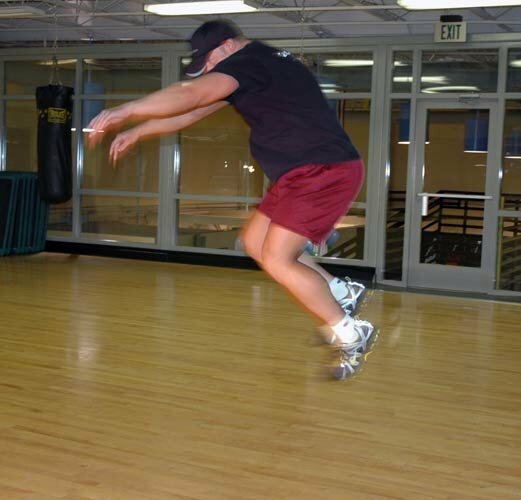 When you perform repeated bouts of intense exercise, there is a shift toward greater aerobic energy contribution. This study shows that you should gain some aerobic fitness adaptations when you train with sport-specific intervals. In theory, this type of training should best prepare you for repeated bouts of intense exercise (such as repeated downhill ski runs). As for exercise efficiency, you should train as specifically as possible to your event. 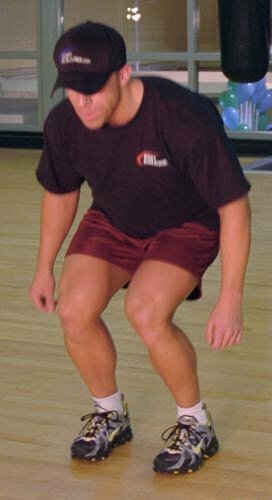 Unfortunately, that can be difficult for skiers, but that's why the "Ski Crouch" is in your program. Conclusion: Hit your intervals hard, rest hard, and improve specifically to your sport! One of your biggest concerns may be how to incorporate all of this without spending 3 hours in the gym each day! A warm-up with a balance component: Everyday. Explosive training with a balance component: 2 times per week. Strength training addressing isometric, eccentric, and sport-specific strength: 1 heavy leg workout, 1 heavy upper body workout, and 1 "Neuromuscular Leg Training for Athletes" workout. 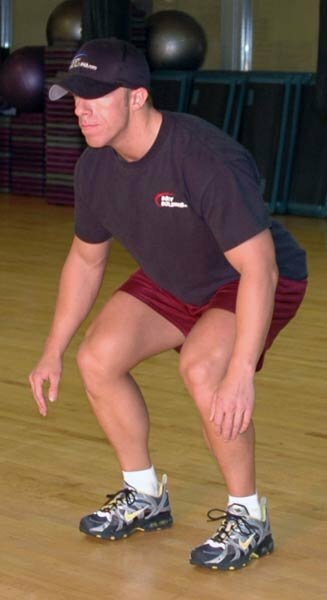 Ski Crouch muscular endurance training: 2 times per week (after leg workouts). Limited aerobic training and emphasized anaerobic interval training: 2-3 times per week (after explosive training). Like all good training programs, the Alpine Skiing program should be modeled on periodization to bring you to your peak conditioning as the season approaches. Because you will be required to balance while fatigued when on the slopes, you should incorporate some fatigue-state training into your program. Only after weeks or months (depending on your original fitness level) of general preparation should you advance to balance training in a fatigued state. It is imperative that you train with safety first. It is your overriding priority! Be conservative and acknowledge when to stop an explosive drill or set, so that you avoid any risk of injury!